On Monday, EFF leader Julius Malema took the platform offered by his latest court case as a chance to wax on land, white South Africans and the ANC. It’s been a strong year for the party and as the march to 2019 begins, Malema will only benefit from the ANC’s decline. By GREG NICOLSON. After Afriforum took Julius Malema to court for singing Dubul’ibhunu in 2011 Judge Colin Lamont had to find the balance between free speech and hate speech. He couldn’t deliver such a judgment without also looking at the changes in South Africa. Six years later, Malema is again in court on charges laid by Afriforum and Lamont’s notes on the country’s transition serve as a backdrop to EFF leader’s recent appearance in the news. The ANC is in crisis, both because its policies haven’t done enough for the country and because its leaders have been exposed as more focused on benefiting their friends than society. As the ANC turns on itself, calls are growing for more radical policies to change the structure rather than the surface of South African society. Malema’s voice is filling the gap to speak on the discontent and pain of transformation, and the ANC is giving him ever greater platforms. 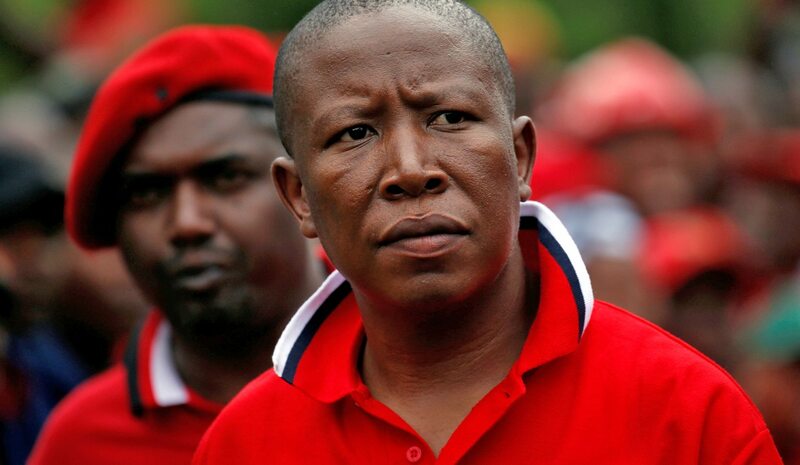 Before Malema appeared in the Bloemfontein Magistrate’s Court on Monday, media reports suggested he’d either been arrested or was the subject of a police “manhunt”. He’d been caught speeding, far above the limit, and refused to stop, the reports said. While the idea of Malema speeding down the N1 with a convoy of cops on his tail could have been South Africa’s OJ Simpson moment, it wasn’t to be. The EFF leader said he had heard reports of his arrest while he was still on the way to court. Later his driver was arrested for speeding. In the pain of transformation, reports of arrest, and the charges faced in the magistrate’s court, Malema once again tapped into the anger over how little the country has changed since democracy. Speaking to supporters outside the court after his case was adjourned – Malema is challenging the constitutionality of the Riotous Assemblies Act of 1956 he’s been charged under for calling for land invasions – the EFF leader started by thanking the ANC. “Because if it was not for the ANC we were not going to be in Free State today. They invited us today,” he said, suggesting the charges were politically motivated. Throughout his speech, Malema portrayed himself and the EFF as champions of justice, persecuted for challenging the status quo. Malema had two key points: The ANC has failed the country by abandoning radical policies aimed at rapid transformation and the racially-skewed economy continues to oppress black people and benefit whites. Land expropriation is the key rallying cry. “The ANC dumped the Freedom Charter in a political dustbin. We went to fetch it. We cleaned it up and they are offended by the fact that we cleaned up the Freedom Charter. We are implementing the Freedom Charter,” he said. Land redistribution and retribution has been a monumental failure under the democratic government. “Give back the land” is a growing call, particular in youth movements like #FeesMustFall, which could represent a significant number of voters in 2019. “Why is the black nation suffering? Why is the ANC not doing anything about it? We will do something about it. We will fight for it. We will do everything in our power, whatever it takes, to collapse white supremacy and replace it with an equal society where there will not be black or white, there will be humanity. All of us we will enjoy the fruits of our freedom,” said Malema. On Monday, the EFF leader was at points screaming into the microphone. He’s hit the right pitch, with the right topics, at the right time. Whatever side of the political spectrum, including the ANC, no one is happy with the pace of change in the country. Everyone, even the DA, recognises that the economy and culture remains racially biased towards whites. The challenges have defined the country since democracy, but they have taken on a new life as dominant politics crumble. The ANC has failed, the ANC is in rapid decline and as it falls, taking its policies with it, a new country can emerge. Malema is positioning the EFF to take a key role in that new country. It’s been a successful year for the party. The EFF led efforts to force Zuma to pay back the money spent on his Nkandla home. The party didn’t perform as well as it had hoped in the local government elections, but by giving its votes to the DA it removed the ANC from power in Johannesburg and Tshwane. Along with the DA, it pushed for the release of the Public Protector’s report on state capture, but it also did what the leading opposition party cannot: it showed its mobilising force and shut down Tshwane on 2nd November.